I have noted about a dozen times why not only are these not practical solutions, I never asked for solutions because I already have them, I simply wanted to know if the behavior was to be expected. 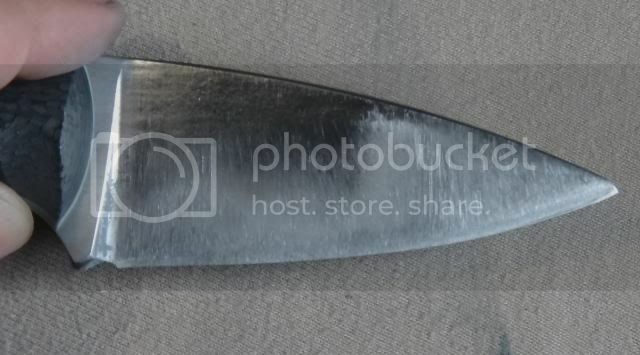 The really curious thing is that I have found that the Hinderer/Bark River attitude has really biased my perspective of online manufacturer forums as all I was thinking when I was reading this was "Well if I had asked similar on the BR forums it would have just caused the banhammer to drop and the thread to be deleted." In short those extreme responses have made pretty much any normal response see positive. Edited 1 time(s). Last edit at 07/25/2013 03:19PM by CliffStamp. Does anyone make a cheap sodcutter with a pass through sharpener in the sheath, like I think the Gerber LMFs have? That and a very easily sharpened steel sounds like the best solution here. There are knives actually made for this work, gardening and such and sod cutting generally isn't knife work and most of the knives I have been using are not overly good at it. I am using them for the sake of using them in most cases because it provides information on many aspects I am interested in on both the knives and the stone. If I was going to to it practically I would radically change the knives, specifically the blade would need to be much thinner and I would switch the stone to a very coarse diamond. It might be interesting to try a serrated knife as well. The Japanese have a knife called a 'Hori Hori' or digging knife. It looks like an operators dagger and even has depth markings to see how much penetration has occurred. Edited 2 time(s). Last edit at 07/25/2013 11:53PM by Edmund Lim. It seems that most knife collectors (in reality, accumulators) have no comprehension of "expected behavior," If they are dissatisfied with a knife they simply return it or trade it. If the knife is actually a user, perceived flaws may be more acceptable (for the price) but the attitude is mainly to deal with the short comings or return it. Again, the idea of "expected behavior" is rarely part of the thought process, so I doubt that you will ever get a better response. I have a 710 and a 940, both of the pivots loosen trivially...just use thread locker. Edited 1 time(s). Last edit at 07/28/2013 06:23AM by RFL. It seems that most knife collectors (in reality, accumulators) have no comprehension of "expected behavior,"
Yes, that is why there is so much misinformation in the community because there is rarely any attempt to verify performance and what is worst when people do have issues they then repeat them as absolutes. However the makers/manufacturers are not totally without blame in this regard because they do not often respond well to questions about expected behavior. The reason for this of course if they admit it is a defect then it is known 100%, if they ignore it then there is doubt which means a certain amount of people will not see it as a fault and can accept user faults/bias/reporting etc. . I can accept thread lockers as secondary retention but not primary. That is either poor design or execution or both. Cliff how thick is the sure fire behing the cutting edge compared to the others. 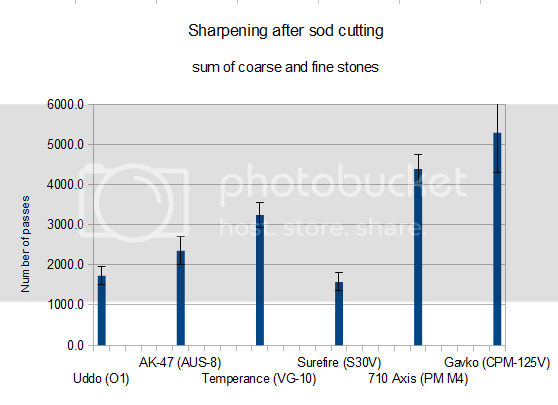 Just looking at the graph it would appear that the s30v is super easy to grind. I can't however imagine it is thinner at the apex than mike's knife. Or does that demonstrate the difference between s30v and s125vn? The Delta was almost full zero grind, the bevel was (is) just barely visible. That was intentional as I wanted to see could it compensate for the low grindability - it did. This isn't surprising, it was just adding another line of data to the experiment. Note that through the tip the curvature increases, it is 10 dps through the tip, this is to reduce damage from prying and such. The tip is more narrow so the instability is higher in cuts and will take more stress in the same cutting. As a note about markers on the edge, after the marker was removed from the bevel past the point it could be seen it still took approximately 1500 dps to fully apex the edge. This steel is very difficult to grind. It is likely that over time as I use it and sharpen it I will full zero it from spine to edge. Just read the thread on the BM forum. Sounds like you just have a bum 710. I've carried an axis lock since the 710, which I refuse to buy another of because of the recurve. I've even used them (a 730 Ares) as a throwing knife and never had any lock issues. Sounds like you got a lemon.